PRODUCT: Skynet Skylight Secure-Attach Brackets. One Pair (2). Price/Pair. 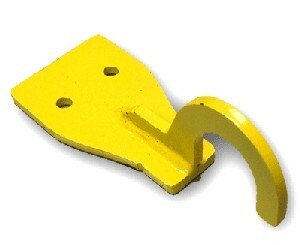 DESCRIPTION: The SKYNET Secure Attachment Brackets are used to mount SKYNETs in flat mount, sloped and applications. Screws/Fasteners NOT included. Easy to Install (see Product Datasheet for instructions). LES Raptor COLLAPSIBLE SKYNET, 6x6. Skylight safety Net System. Collapable design folds in half for easy storage and setup. Fits up to 4x4 foot skylights. Price/Each. Raptor SKYNET, 6x6 Fall Protection. Skylight safety Net System. Fits up to 4x4 foot skylights. Price/Each.